The latest numbers from comScore rank both smartphone platforms, in which Apple's iOS is second only to Google's Android, and hardware usage, where Apple took fourth. Both of Apple's rankings for the first time narrowly bested RIM, which took third in platform, and fifth in hardware. Apple's 26 percent U.S. platform share recorded between February and April was up 1.3 percent from the 24.7 percent it held in January. While Apple's presence grew, RIM lost 4.7 percent in platform share during the same period, allowing Apple to edge its 25.7 percent share in April 2011. Apple's iOS and Google Android were the only platforms to grow in share between January and April, the survey found. But Android's 5.2 percent growth well exceeded Apple, giving the search giant's platform a 36.4 percent share of U.S. mobile phone subscribers. The battle between the iPhone and BlackBerry shows a similar story in hardware usage, as Apple grew 1.3 percent from January to April, representing 8.3 percent of U.S. mobile phones. During the same period, RIM lost 0.4 percent, dropping to 8.2 percent —0.1 percent behind Apple. Apple still has a ways to go to catch third-place Motorola, which had a 15.6 percent share of hardware U.S. units in April. But that total was also 0.9 percent down from January 2011. The only other manufacturer in the top five to see a gain was LG, which inched up 0.1 percent to 20.9 percent. Market leader Samsung lost 0.4 percent between January and April, slipping to 24.5 percent. comScore found that 234 million Americans ages 13 and older used mobile devices in the three-month span that ended in April. 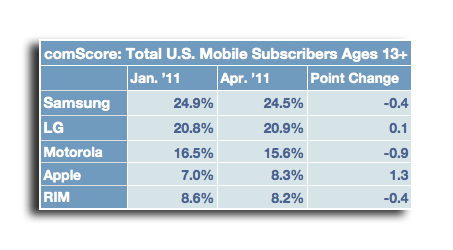 Of those, 74.6 million in the U.S. owned smartphones, up 13 percent from the three-month period ending in January 2011. The MobiLens data from comScore is based on an online survey of a nationally representative sample of mobile subscribers age 13 and up.